People focused on M&A work can tend to think of the well-known legal AI companies that do NLP-driven doc review when it comes to technology. But, we can sometimes overlook companies such as Merrill Corporation, which are very much at the ‘foundation’ level of due diligence review before the AI even gets to work. 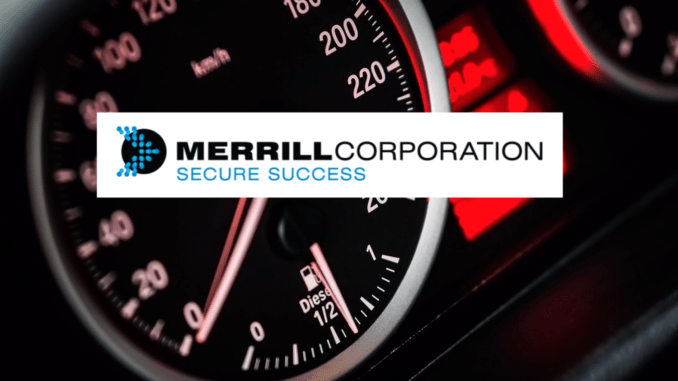 Artificial Lawyer chatted with Merlin Piscitelli, an American who has been based in London for 13 years, about what it is that Merrill does and why it matters. Simply put the company works with all the parties of an M&A deal, including the law firms, to put together the massive data rooms needed for a deal to move forward. And, if your data is a mess to start with no matter how clever your review tool’s NLP then the due diligence process will not end well. There’s the OCR stage of extracting all the info from the documents, and then its DatasiteOne system automatically builds an index based on the titles of the files you upload. This then allows searches based on simple terms or complex word combinations. This then in turn allows the development of an electronic document management library, which can have access controls applied from uploading to viewing, printing and downloading content. Parties can also track activity and produce real-time reports for valuable insights. So, there you go, that’s it in a nutshell. Not necessarily Earth-shattering, but you aren’t getting very far without providers like this. And the OCR bit really is crucial – and they’ve got very at good at it. ‘Our OCR takes every single character and it lifts it off page and puts it all into a relational database that uses fuzzy logic,’ Piscitelli explains. Piscitelli notes that they have got it to a stage that it can pick up text from really old type faces. The oldest so far are deeds from the 1800s. They’ve also had their teams work with simply big old bags of assorted papers that a client has handed over to them, perhaps proving that not all legal departments are super-organised. They have two processing centres, one in St Paul, Minnesota and also one in London for EMEA, he adds, that have to deal with the document onslaught. Getting the foundations of the deal data right is essential. But, what if you have a really blurry piece of paper, or a scan of that blurry piece of paper? What then? ‘We can usually find some additional sharpness. We can do this with JPEGs as well,’ he explains. And signatures? That has always been something of a bugbear for all of the OCR world as a whole, simply because so many people have totally random ways of signing. It’s not really feasible to expect any kind of OCR algorithm to do this perfectly….yet. And clients realise that. All well and good. But, isn’t it the AI doc review part that still really saves time in a deal? But, Piscitelli is clear that what they provide is as much a central part of the time savings in a deal, as much part of supporting faster ‘deal velocity’, as what any of the NLP companies are providing. After all, weak OCR…? Badly organised first set of digitised files in the data room? Well….that is going to slow things down from day one. In short, what Merrill does is perhaps not always seen by the market, but without their work it would be a lot harder for the legal AI companies to swing into action. They are also very much a part of improving efficiency in the legal world and keeping deal teams around the world in action. So, the next time you’re part of a discussion about AI review processes, spare a thought for the ones working on the foundations. Unfortunately, until Merrill (and/or its sell-side clients) make the documents hosted in their M&A virtual data sites accessible to AI tools used by potential buyers, the benefits of AI will remain out of reach to bidders’ advisors conducting buy-side due diligence.